ARLINGTON, Va.—Same story, different year, some might say of new data from the National Science Foundation (NSF) that shows almost across-the-board reductions in the numbers of doctoral science and engineering (S&E) degrees earned in 2002. The 24,500 degrees nationwide represent the lowest number since 1993. A nationwide survey reports the number of research doctoral degrees in all fields earned by students attending U.S. universities declined by 2 percent last year, dipping under 40,000, which marks the first time in nine years doctorates fell below that threshold. Overall, 413 universities across the United States and Puerto Rico awarded 39,955 doctorates. In the previous survey, the number of doctoral degrees awarded in 2001 in all fields slipped below 41,000 nationwide for the first time since 1996. And in each of the past two years, the drop in overall earned doctorates can be attributed to the continuing decline in the number of students earning science and engineering Ph.D.s. The most recent downturn in S&E doctorates began after a 27,300 peak in 1998. That same year, doctorates in all fields reached a high of 42,650. Influenced by S&E doctorate production, however, the trend in overall doctorate awards since 1998 has turned mostly downward. In 2001, for example, slightly more than 25,500 science and engineering doctorates were awarded, down from nearly 26,000 in 2000. In 2002, that number dipped again to about 24,550 nationwide, representing a 10 percent decline since 1998. Meanwhile, the number of Ph.D.s awarded in most other fields remained nearly the same, hovering around 15,400 annually since 1998. 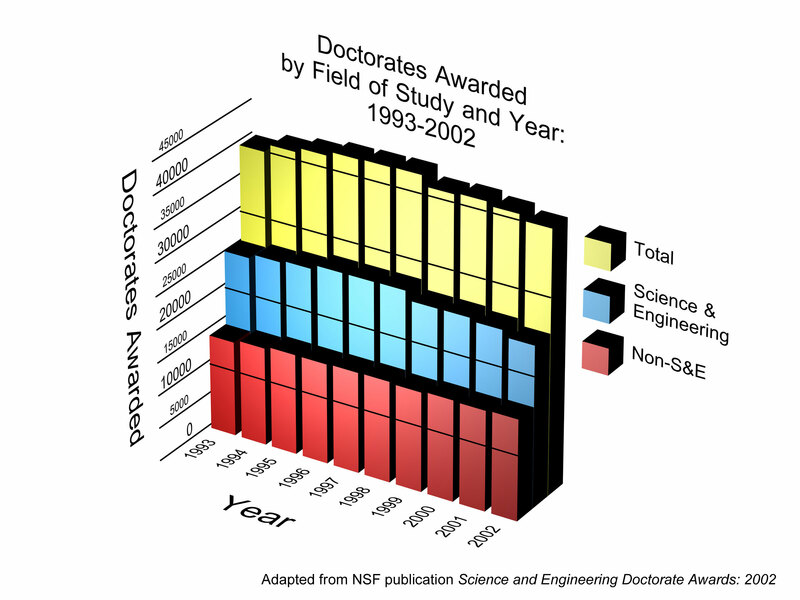 The complete data for S&E doctorate degrees are published in NSF's Science and Engineering Doctorate Awards, 2002 ( http://www.nsf.gov/sbe/srs/nsf04303/start.htm ). According to the 2002 SED, women received 45 percent of the total doctorates awarded. That was 1 percent more than the year before and represented the largest share ever in a trend that continues upward. Further, "it was the first year in history that women earned the majority of research doctorates awarded to U.S. citizens," said Tom Hoffer, senior research scientist and SED project director at NORC. In S&E disciplines alone, women received 37.3 percent of doctorate degrees in 2002. "The growing participation of women in S&E fields remained strong," Hoffer said. In the year before, women earned 36.5 percent of S&E doctorates. In the physical sciences (physics, astronomy and chemistry), a key area in which women are still much underrepresented, females earned 26.8 percent of all doctorates in 2002, compared with 25.1 percent in 2001. "That's about double the overall increase for women in all S&E fields combined," said Joan Burrelli, an NSF senior analyst. "And the physical sciences needed the boost, because overall, the number of doctorates there sharply declined by some 4.7 percent since the last survey." She added that physics and astronomy took the brunt of the reductions between 2001 and 2002. More broadly, the total number of doctorates in the physical sciences, which reached about 4,000 in 1994, fell to 3,200 in 2002. And since 1998, doctorate awards in those fields have fallen by 16 percent. Burrelli also noted the continuing underrepresentation of women in engineering. "Women still have a way to go there. They received 17.5 percent of the doctorates in 2002, compared to 16.9 percent the previous year, while in the sciences, women are now above 42 percent of the total Ph.D.s earned." U.S. reliance on foreign-born talent for its academic and industrial base continued in 2002. Within science and engineering, 23,152 doctorates were awarded to students whose citizenship was known; 8,839 of those went to non-U.S. citizens. That is more than 38 percent of the total, the same percentage as in 2001. In engineering alone, foreign-born persons receiving doctoral degrees in 2002 represented more than 60 percent of the total. Between 1993 and 2002, foreign citizens earned just over 57 percent of all engineering Ph.D.s. Meanwhile, among graduates whose citizenship was known, less than 18 percent of the nearly 37,300 doctorates awarded in all other areas went to non-U.S. citizens, just 1 percent more than in 2001. Overall, the number of engineering degrees has declined sharply since 1996, when a high of 6,300 doctorates were awarded. Slightly more than 5,000 doctorates went to engineers in 2002 compared with 5,500 in 2001. 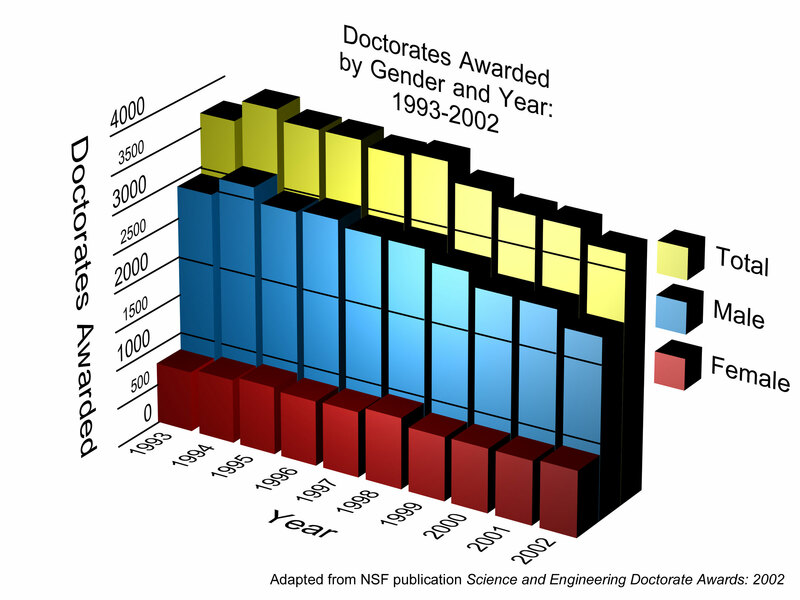 About 5,300 engineering doctorates were conferred in both 1999 and 2000. The 2002 decline cut across citizenship designations and occurred in most fields except for civil and industrial engineering. African Americans and Latinos, the largest underrepresented groups, made small gains in the overall number of doctorates awarded between 2001 and 2002. Those groups received 10 percent of the total doctorates in 2002, while earning 9.6 percent in the previous year. Within science and engineering, African Americans represented 3.4 percent of the 2002 doctorates, the same as the previous year. Latinos increased from 4.7 percent of total S&E doctorates in 2001 to 5 percent in 2002. The number of mathematics doctorates also declined sharply in 2002, dipping to well below 1,000 overall for the first time since 1990, according to NSF historical statistics. Computer science doctorates also declined in 2002, continuing a steady slope downward since 1995. But, the report says, the number appears to be leveling off. The 2002 Survey of Earned Doctorates carries a special section on the characteristics of first-generation college graduates. Within the newest group of Ph.D. recipients, 37 percent reported that neither parent earned at least a bachelor's degree. Well over a third of this group, then, are not only first-generation college graduates, but Ph.D.s as well. "While having college-educated parents is still an advantage in the quest for a doctorate, a substantial number of first-generation scholars are reaching the top of the U.S. education pyramid without that beneift," Hoffer concluded. NSF is an independent federal agency that supports science and engineering research, and education programs, as well as the reporting of statistical information on broad areas of national interest. NSF funds the nationwide, all-fields doctorate survey and the detailed science and engineering data tables. The National Institutes of Health and the Department of Education are also major funders. Additional support comes from NASA, the National Endowment for the Humanities and the Department of Agriculture.